Walter Fossin Coachman, Jr. (1894-1952) and Charles Rogers Coachman (1896-1959) were brothers from Jacksonville, Florida, who attended the Lawrenceville School just before and through World War I.
Walter Coachman, Lawrenceville Class of 1913, from the 1913 Olla Podrida. Walter Coachman entered Lawrenceville in 1910 and graduated in 1913. Following his graduation from Yale in 1916, he served as a First Lieutenant in Field Artillery in World War I. Following the war, Walter became the Director of the Commodores Point Terminal Company, a Jacksonville, Florida-based company that handled naval stores, i.e., products derived from pine sap that were originally used in shipbuilding, including turpentine, resin and tar. In 1933, Walter resigned his position to promote a proposed Florida cross-state canal project coordinated by the Florida Ship Canal Authority that was intended to connect the Atlantic Ocean with the Gulf of Mexico for barge traffic. He died in 1952, his dream of a cross-state canal never fulfilled. 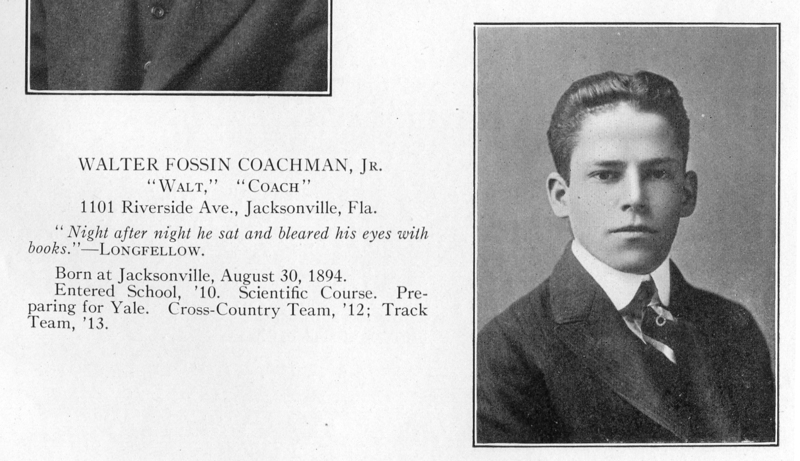 Charlie Coachman, Lawrenceville Class of 1917, from the 1917 Olla Podrida. 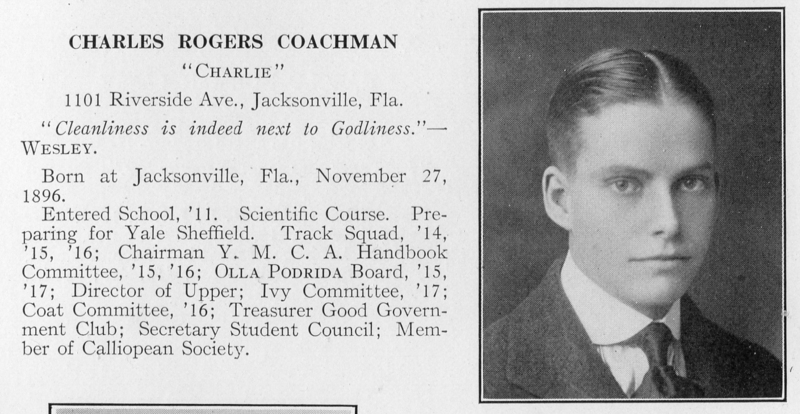 Charles (Charlie) Rogers Coachman entered Lawrenceville as a member of the First Form in 1911 and graduated in 1917. Following his service in World War I as a U.S. Naval Seaman Second Class, Charles attended Yale University. In 1923, he began his own lumber business, but became enthralled with aeronautics following a flight training course at Parks Air College in 1928. Charles’s love of aeronautics eventually led him to a position as the chief of the Policies and Procedures Branch of the Federal Aeronautical Administration Center in Oklahoma City, Oklahoma, a facility which is now the primary specialized transportation training and research facility for the Federal Aviation Administration and Department of Transportation. Charles died in 1959. The photographs on this page are part of a collection of candid photos taken by the Coachman brothers during summer trips between 1913 and 1920s to such locations as Glacier National Park and Atlantic City. There are several photos of Woodstown, New Jersey, as well, although it is not yet known what connection the brothers had with that South Jersey town. Charlie Coachman L1917 on a summer trip to Glacier National Park in 1914. Summer trip, 1913, unknown location. Charlie Coachman L1917 on a horse during a summer trip to Glacier National Park in 1914. Photo taken from the caboose of a train during the summer of 1920. Note the train on the side track. Is it passing by or stationary? July 4th parade, Woodstown, NJ. The animal pulling the cart appears to be a burro. July 4th parade, 1915, Woodstown, NJ. Atlantic City, NJ, unknown date. View of what appears to be horse racing on the beach of the Atlantic Ocean at Jacksonville, Florida. The caption reads “Summer trip 1913, coming back from [indecipherable word similar to Jerome] Glacier.” So far, we have not yet deciphered what glacier might be referred to here.